I was putting together some finishing touches on a set of notes for tomorrow’s class on heterocyclic chemistry. Over the past year I have developed a strong appreciation of aromatic heterocycles, which is mainly due to my lab’s current interest in how to put these systems together using boron transfer reagents. While I was doodling some thiazoles on a sheet of paper, I was thinking about the utility of these molecules as kinase inhibitors. Many heterocycles endowed with hydrogen bond donor/acceptor motifs are capable of establishing contacts at the kinase hinge region. Specificity is another question, but let’s set it aside for now. When you look at the thiazole core, it is tempting to ask a seemingly ludicrous question: “What about that CH bond next to the acceptor nitrogen? Can it interact with the protein backbone?” I brushed this thought away as heresy, but it kept coming back. So I said: “OK, let’s look at the literature. There is no way there is anything remotely close to this silliness out there”. 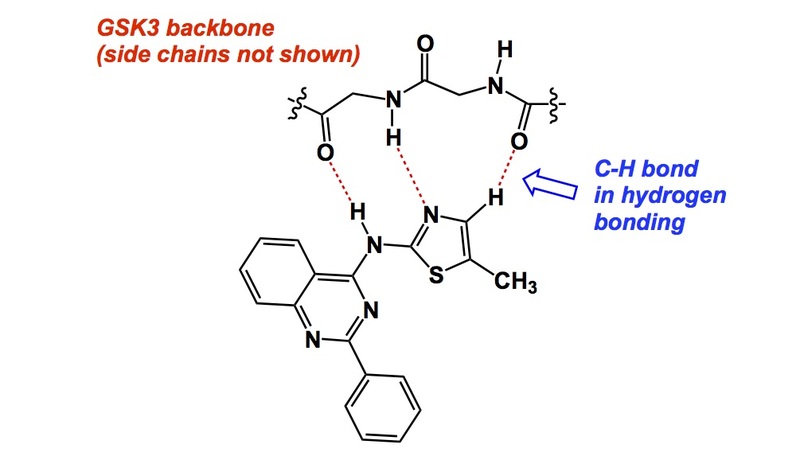 Well, it turns out I was wrong – there is a very interesting report from Vertex, wherein the CH bond in question has been implicated in a hydrogen bond with the hinge region. This gives me a chance to vent about one of my pet peeves: do not publish papers in ACS journals unless you are willing to deposit the coordinates of your structures in the pdb! The example below can be a very useful and instructive tool in medicinal chemistry classes. As they say, a picture is worth a thousand words. However, if you are not willing to let us download the pdb file (due to patent considerations, of course), do not publish it in a chemistry society journal. Submit it to the Proceedings of the Transylvanian Society of Patented Inventions instead. I hope people at Vertex and other companies hear me. Instead of my usual picture with a visually appealing view, I am forced to offer a ChemDraw rendition of the interaction. Some of the most amusing dynamics in science happen when a given field becomes overcrowded. Many factors contribute to the exponential increase in attraction to a given problem. These factors range from the innate significance of questions that need to be resolved to the low barrier for entry. In the latter case, there is a chance to make rapid gains with fairly modest expenditures. I would submit that every research field has some skeletons in its closet. The area of C-H activation has certainly been a very popular arena for innovation, delivering new ways to construct molecules. But what about some skeletons from the closet in this field? In my mind, such skeletons would correspond to foundational contributions made a long time ago, yet lost in the tidal wave of papers everyone thinks should be cited. A case in point is an important report by Rawal and co-workers published in the Journal of Organic Chemistry in… 1997. That’s right, way before the whole craze took over the synthetic organic community. Take a look at this fine piece of research and see what you think. I suppose many of you might have an eyebrow (or two) raised when you see the content of this report and then consider the year it was published in. I am not saying that this paper is not being cited, I am just saying that it is probably not mentioned often enough, at least in the talks I have recently attended at various conferences. A good friend of mine brought this manuscript to my attention. Earlier this week, and while still in Shanghai, I heard a thought-provoking talk by Professor Max Malacria of the Université Pierre et Marie Curie. This research, recently published by Angewandte Chemie, is built around a serendipitous finding made when isothiourea was reacted with one equivalent of [Pd(dba)2] and an equimolar amount of tris(p-fluorophenyl)phosphine in dichloromethane at room temperature. The red crystalline product formed during this transformation is a fascinating cluster shown below (characterized by X-ray crystallography). This begs a question: how is it that this was never seen before, with all those palladium chemists putting every structural aspect under scrutiny? I suppose this goes to show how little we know about what goes on in our flasks. By the way, Max mentioned another, even simpler, means of preparing this compound (I cannot disclose this) which makes me really wonder why this sort of chemistry had remained veiled until recently. Curiously, the overall composition of the cluster contains what one would instinctively fear in palladium catalysis: the dreaded association with the thiolate “poison”. But the cluster, which combines three palladium atoms, three phosphines, and three thiolate ligands, is apparently catalytically active and is quite stable. I am certain there will be a lot more applications of this chemistry in the future. 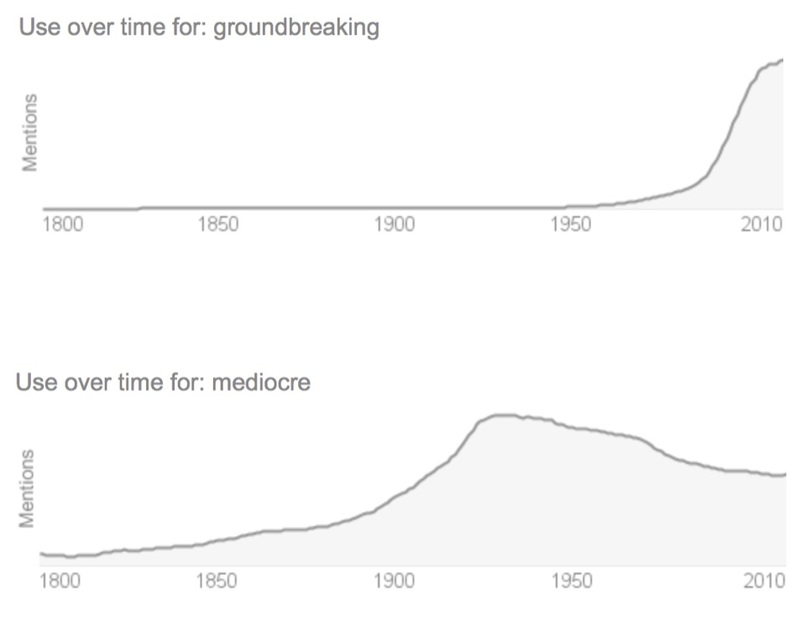 They say that necessity is the mother of invention, but I think it is more about serendipity. In an effort to prepare for one of my lectures (I start my segment of CHM 440 next week), I needed to come up with an impressive example of academic innovation that has made a difference in industry and was rapidly adopted. In particular, I was seeking a case of a chemoselective transformation. It did not take me long to find one among the papers I have collected over the years. I want to share it with you tonight as I think this is a marvelous case of a reaction that is mechanistically simple, yet immensely useful. The story relates to Taxol (paclitaxel) and its isolation from the bark of the Pacific yew. Unlike this very slow-growing tree, the nursery-grown ornamental yews from Michigan’s Upper Peninsula were found to mature in just a few years and could be easily regenerated, making the overall process sustainable. These little guys contained predominantly six primary taxane constituents characterized by structurally different amides in the side chain (shown below). Some years ago, Professor Bruce Ganem of Cornell University developed a process for chemoselective reduction of amides using Schwartz’s reagent. 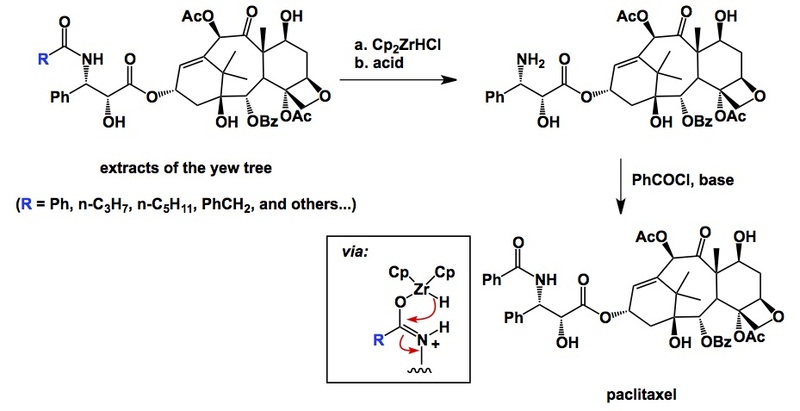 The Zr-O interaction features prominently in this chemoselective process, which was put to good use in the case of yew tree extracts. Hydrolysis and benzoylation of the imines produced during the reduction afforded the ultimate paclitaxel. I would say this is a rather dramatic example of academic innovation that has been rapidly adopted in industry. I am writing this from Shanghai, China, where I am attending the 6th International Forum on Homogeneous Catalysis, organized by Professors Shengming Ma and Yong Tang. Tonight I want to talk about a really neat process developed in Professor Daniel Seidel’s lab at Rudgers University. His team has come up with some interesting and surprising reactions that raise eyebrows as they push the envelope in organic reactivity and show how one can extract new possibilities out of some well-established reactions. Below you see what is to be reasonably expected of an amine, an aldehyde, and an enolizable ketone. Of course, this corresponds to the good old Mannich reaction, which is a trusted friend of many organic chemists. Daniel has put a new twist on this process and developed conditions that lead to a regiochemically different outcome. His Org. Lett. paper describes this advance and traces the origins of the observed selectivity to the formation of an azomethide ylide intermediate. This departure is responsible for the product formation (the initially formed ylide undergoes isomerization). This is not the first process in which the Seidel lab was able to re-route iminium reactivity to an alternate pathway. The toolbox they have developed is some very clever stuff. There is this notion called “paradigm shift”, which is one of the most abused science concepts. The term, coined by Kuhn in his famous book “The Structure of Scientific Revolutions”, had emerged from an observation that science does not develop as a logical progression of incremental improvements. Rather, incremental improvements are followed by crises in which new data cannot be rationalized using the previously accumulated theories. These periods lead to “paradigm shifts” that refer to the advent of radically new concepts that are revolutionary in that they throw previous beliefs down the drain and offer something completely new. The newly born concepts clarify the data that used to be uninterpretable. When I say that the notion of a “paradigm shift” is misused, I am referring to the fact that rubidium carbonate’s dramatic improvement of a cross-coupling reaction (for example) is a decent discovery, but is nowhere near what should be considered a “paradigm shift”. Yet, I see this term used in some fairly trivial cases. I don’t know about you, but I think the real paradigm shift in chemistry occurred when van’t Hoff thought of tetrahedral carbon. The vast majority of other discoveries might be remarkably amazing, useful and interesting, but they are not to be confused with the original meaning intended by Kuhn. I am back from my travel, although only for 2 days. China is calling me now and I will be on my way to Shanghai on Saturday to attend a conference organized by Professor Shengming Ma. This change of scientific scenery is interesting and therapeutic as I am getting used to being involved in completely different communities of scientists. While earlier this week I heard about a lot of new developments in the area of peptides and other biomolecules, I will now listen to some metal catalysis talks at Shengming’s gathering. According to Steve, over-reliance on automated synthesis is really dangerous, which I agree with wholeheartedly. It is really cool that a lab that is dedicated to protein synthesis using shorter fragments does not rely on any automation. Next time my students try to convince me that they cannot live without automated peptide synthesis, I will tell them what Steve said: “There is a tendency to turn off your brain and get into all sorts of trouble once you hit that switch on the synthesizer”. Coming from someone who was trained by Bruce Merrifield a long time ago, this is worth listening to.